Today, we’re going to dangle the carrot so-to-speak, and share some motivational reasons to include carrots in your lifestyle. They are wonderful in smoothies, juices, stir-fries, salads, and even as a stand-alone snack. They are great for dipping too! There is really nothing like crunching on a raw carrot as a delicious and healthy afternoon snack. Make sure to buy organic though, because carrots are on the dirty dozen list, and are therefore known to have high amounts of pesticide residue when grown conventionally. 1. Carrots are the best source of beta-carotene which the precursor to vitamin A which is essential for eye health, the immune system, healthy skin, regenerating damaged cells, and mucus membranes. 2. Carrots contain a considerable amount of vitamin K. Vitamin K ensures that the clotting factors in your blood work properly, and it also is essential for optimal bone health and bone growth. 3. Another great thing about carrots is that they are high in fiber which aids in digestion, constipation, maintaining bowel health, lowering cholesterol levels, controlling blood sugar levels, and weight loss. 4. Potassium is very important for a healthy and balanced lifestyle, and carrots are loaded with it. Not only does potassium act as an electrolyte, it is necessary for maintaining healthy brain, heart, kidney, muscle tissues and other important organs of human body. 5. Carrots are a very good source of Vitamin C which is good for strengthening the immune system, cardiovascular health, preventing strokes, eye health, smooth skin, reducing cellular DNA damage, repairing damage from smoking, and so much more. 6. Manganese when combined with calcium, copper, and zinc is used for strengthening bones, and carrots are a good natural source. 7. Carrots contain a large amount of anti-oxidants which helps fight free radicals, cancer and heart disease. Carrots also contain falacrinol which may protect against colon cancer, lung cancer and breast cancer. 8. We can feel satisfied from eating carrots without eating too many calories, because they contain nicotine acid that breaks down fats and lipids. They are also very high in nutritional value, so that decreases our feeling of hunger by giving the body the nutrients it needs. 9. 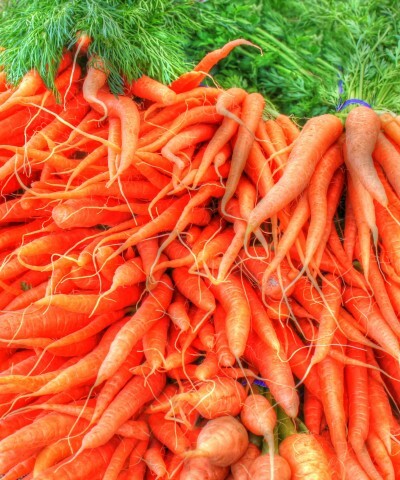 B Vitamins in carrots include B6 (pyridoxine), B3 (niacin), B1 (thiamine), and B2 (riboflavin). B vitamins work together to boost the metabolism, immune system and nervous system. They are also important for keeping the skin and muscles healthy, encouraging cell growth, and more.